Liposuction of the abdomen – stomach in Los Angeles by Aaron Stone MD can get rid of that spare tire. 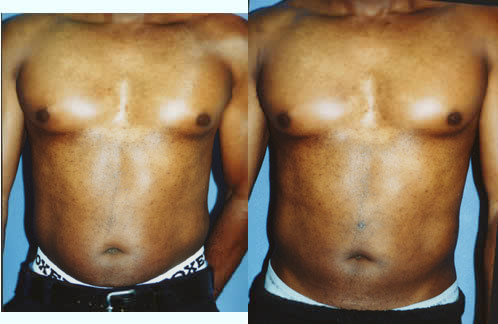 In this before and after male liposuction of the stomach you can see the prominent area surrounding the belly button is less prominent. Before and 3 weeks after liposuction of the abdomen – stomach in a 40 year old, 5’3″ tall, 158 lb woman. In some cases this is performed together with abdominoplasty or tummy tuck. Stomach liposuction surgery liposculpture can enhance your appearance and your self confidence. Realistic expectations are important to be happy with any surgery. As each patient is an individual, different results can be expected in each patient. The alternatives to stomach liposuction are growing. We now have Coolsculpt to freeze fat away and Kybela or Ilipo to melt it away by injection or infrared. There are new technologies coming out every day. However they require multiple treatments over a number of weeks. Liposuction is a one time 60 to 120 minute procedure. In order to achieve an optimal result the surgeon has to assess where the fat is concentrated by finger pinch because it is not evenly distributed under the skin. Then he or she has to account for natural body contours (concave and convex surfaces) during the removal process to recreate these contours. This is made more difficult by the common use of fluid injection just prior to liposuction removal of the fat — tumescent or superwet liposuction. Overly aggressive removal to just get fat into the liposuction cannister can damage the overlying skin causing pigmentation changes and/or scarring and pitting or unnatural surface contours. At the extremes these irregularities are not fixable. The benefits are not being self conscious in a bathing suit at the beach, when wearing midrif exposing shirts or when being intimate. Being pleased with your new appearance can be a major incentive to changing your lifestyle, diet and exercise regularity in order to maintain your new look.